Disclaimer: We partnered with Elkay to bring you this post. All opinions and photography are our own and are not influenced by Elkay. Thanks for supporting the brands that support this blog. 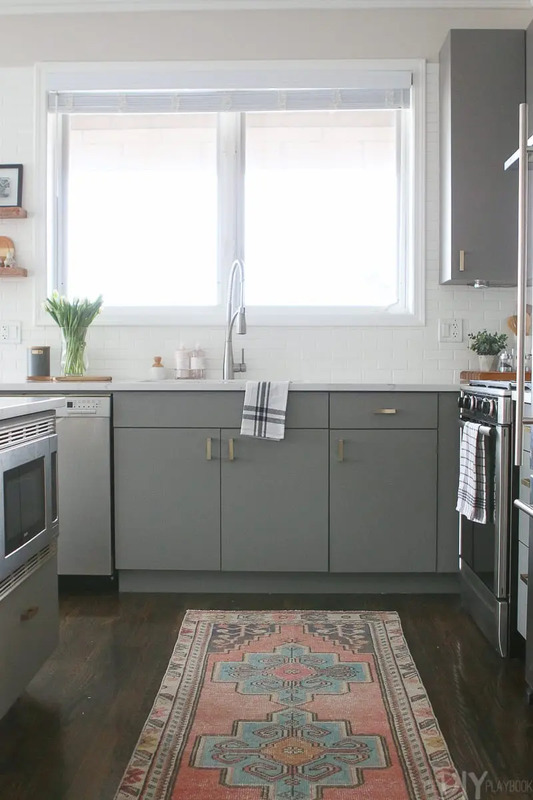 Last month, I showed you guys the before pictures and mood board for my mom’s kitchen. 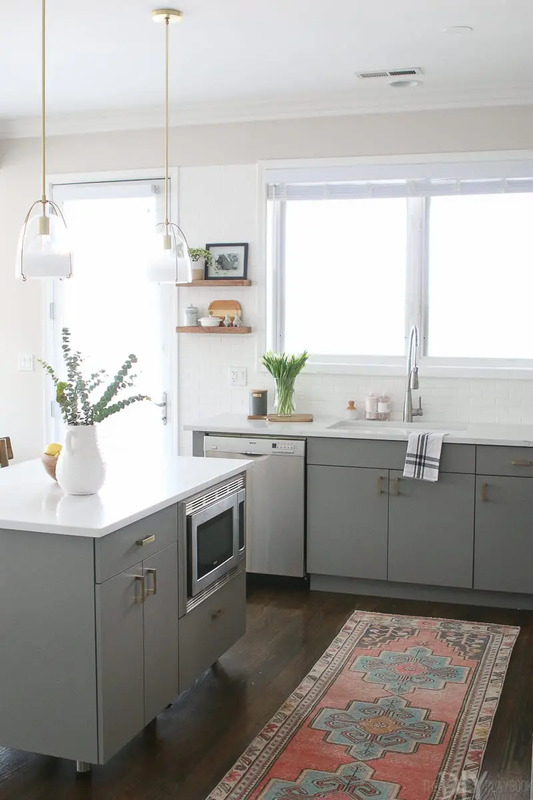 While she didn’t do a complete gut of the space, she did hire a contractor to work on the room and give it lots of cosmetic upgrades…including painted cabinets, new countertops, a backsplash, new sink, new faucet…lots of changes in this small kitchen! 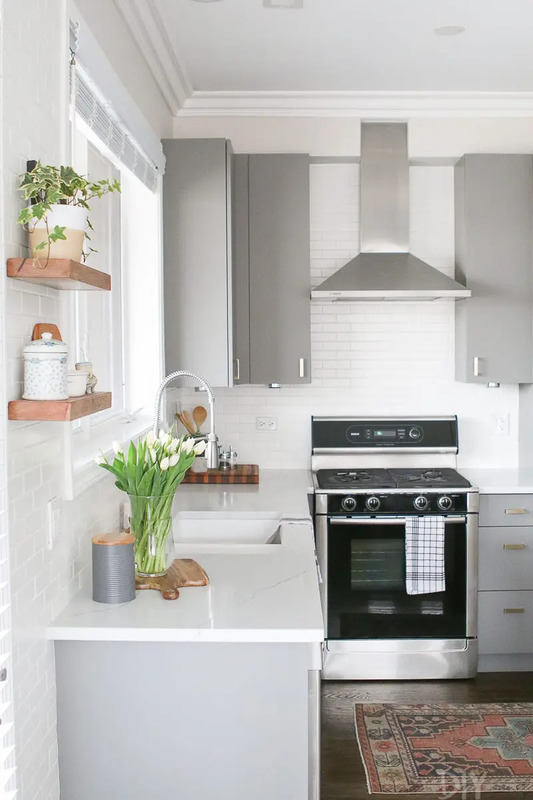 I’m thrilled to reveal her new white and gray kitchen, so let’s not waste any time and get right to all of the gorgeous “after” photos! 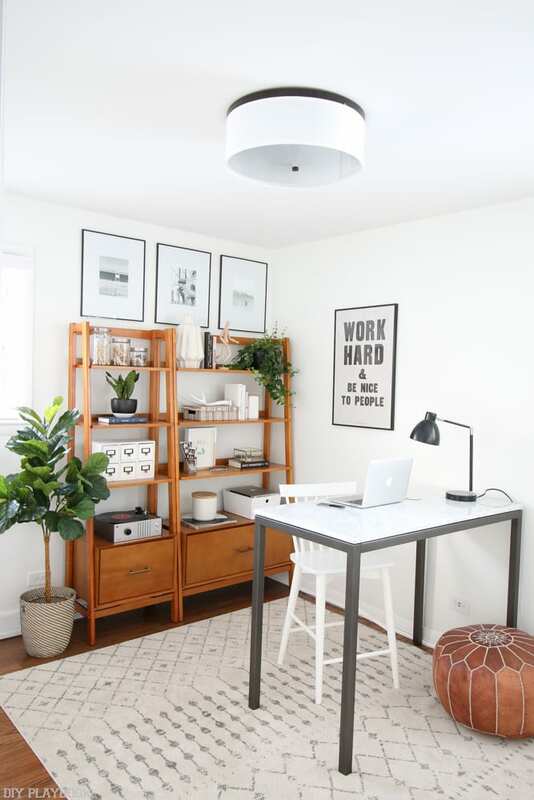 Isn’t this space absolutely dreamy?! 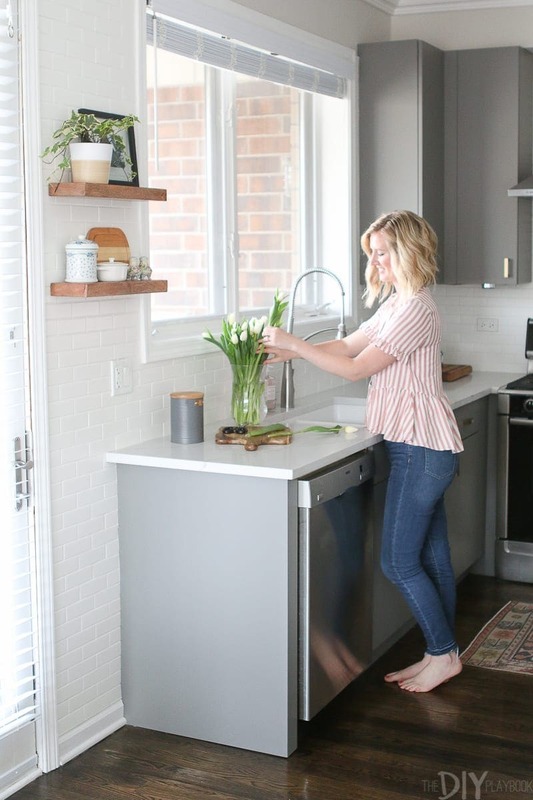 We are so happy with the results because now it really flows so much better with the rest of her home (her bedroom, entryway, and built-ins). 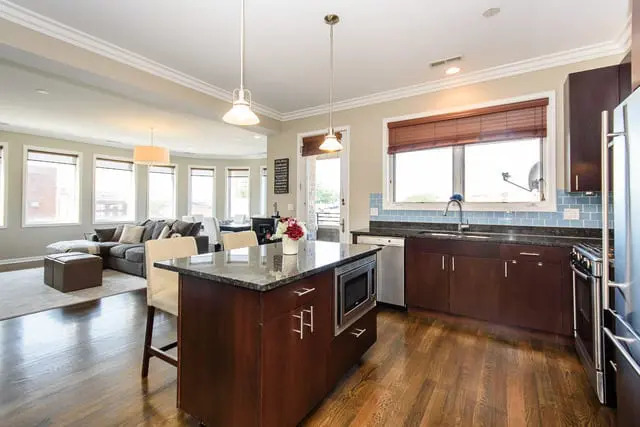 My mom is slowly transforming each space in her new condo to put her own mark on it and this kitchen fits in nicely with her other gorgeous rooms! 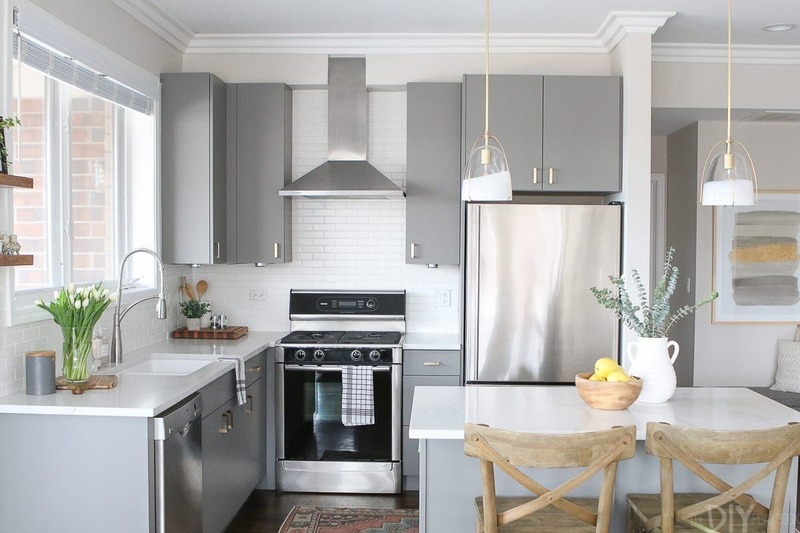 I don’t want to skimp on any details, so here’s all of the scoop about her new gray kitchen. Instead of ripping everything out and installing new cabinets, my mom kept her old configuration and cabinets because they were in pretty good shape. 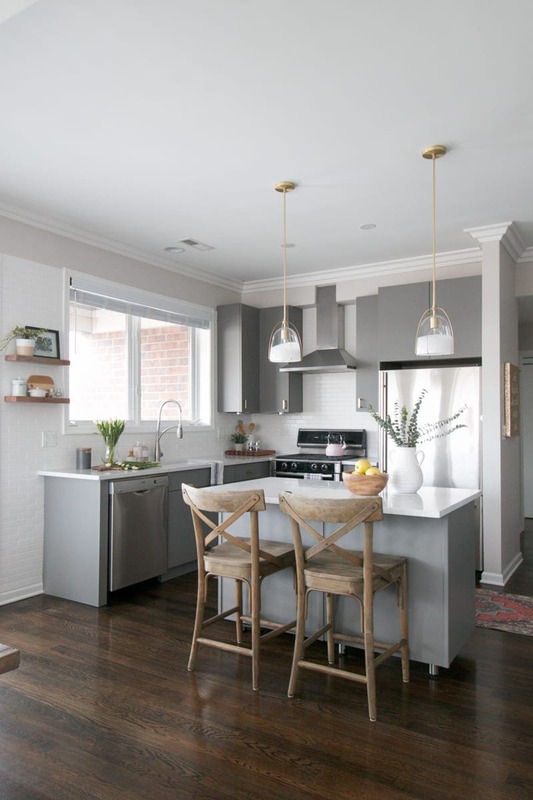 She hired a carpenter to paint them a gorgeous gray color, Benjamin Moore’s Chelsea Gray. Her guest room is actually painted this color (that room coming to the blog soon! 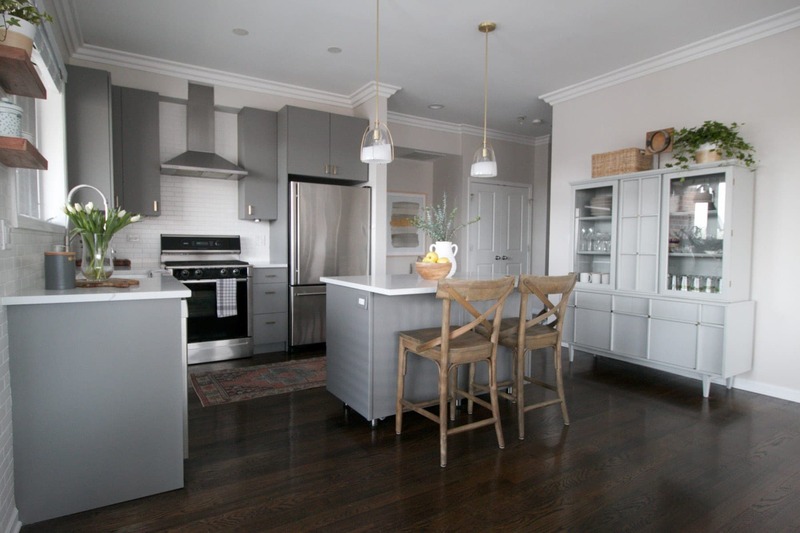 ), and we loved it so much in there that we figured it would work well on her cabinets. 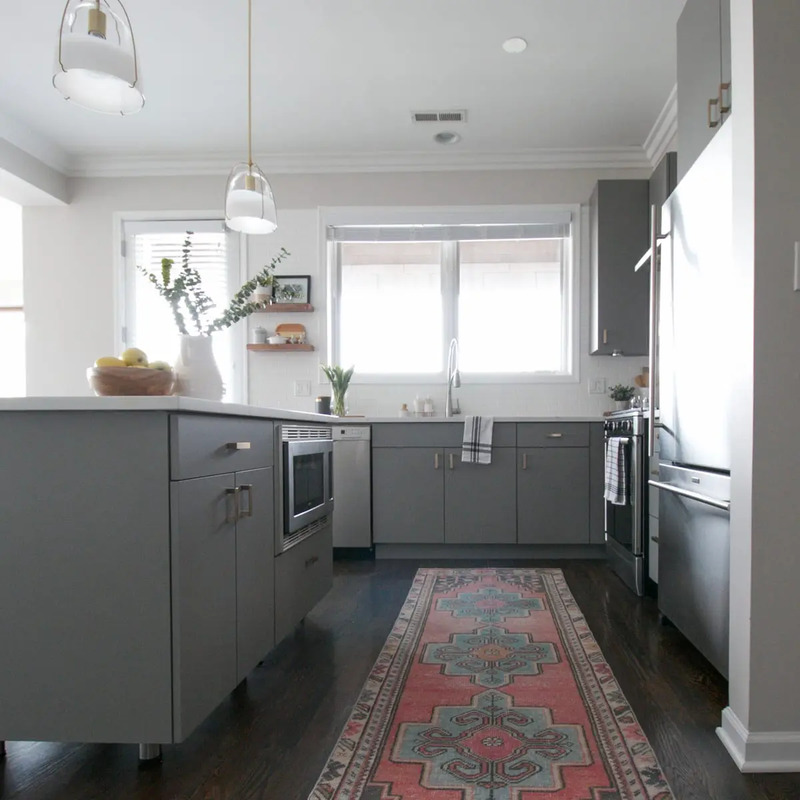 Because the rest of her space is so light, it was nice to have the dark gray to bring in some color. The darker color also makes the brass hardware pop! 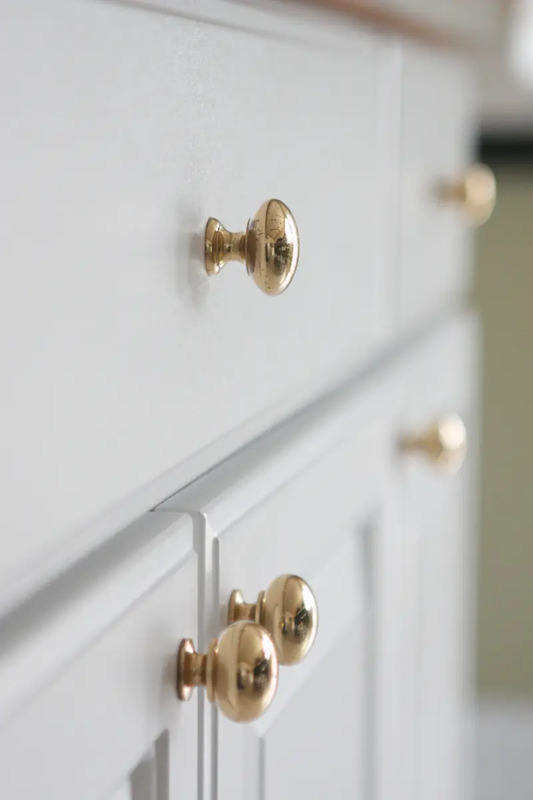 Speaking of which, we ended up going with this brass hardware on all of the gray cabinets and they look amazing. 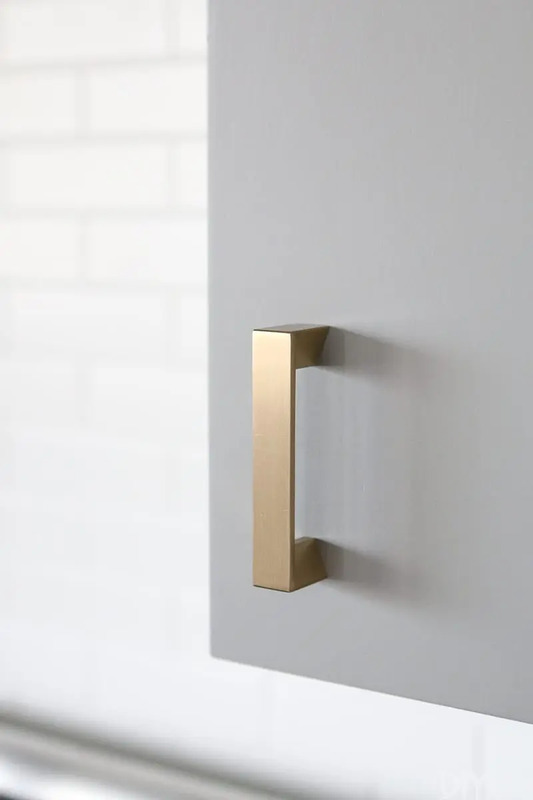 Sleek, contemporary, and a really nice brass color. Highly recommend them! Jan’s old sink and faucet had seen much better days and she was thrilled to receive a new sink and faucet from Elkay. 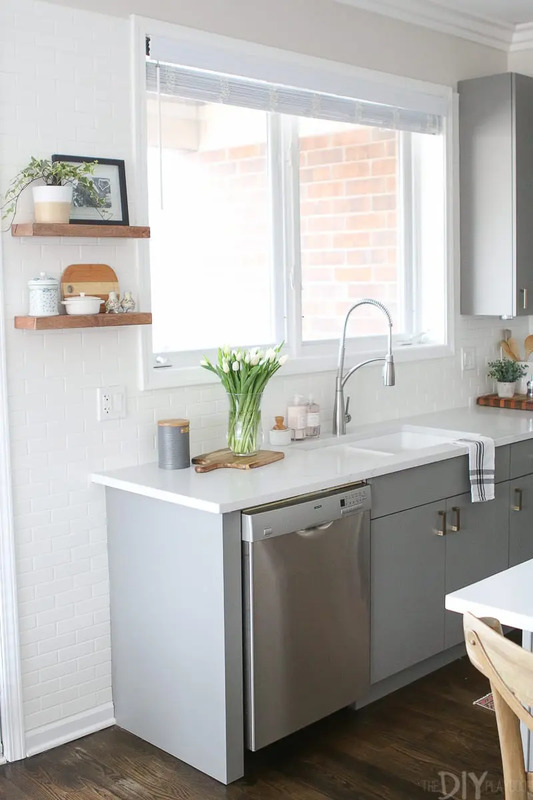 If I ever have the chance to redo a kitchen, I’m definitely going with a white sink. 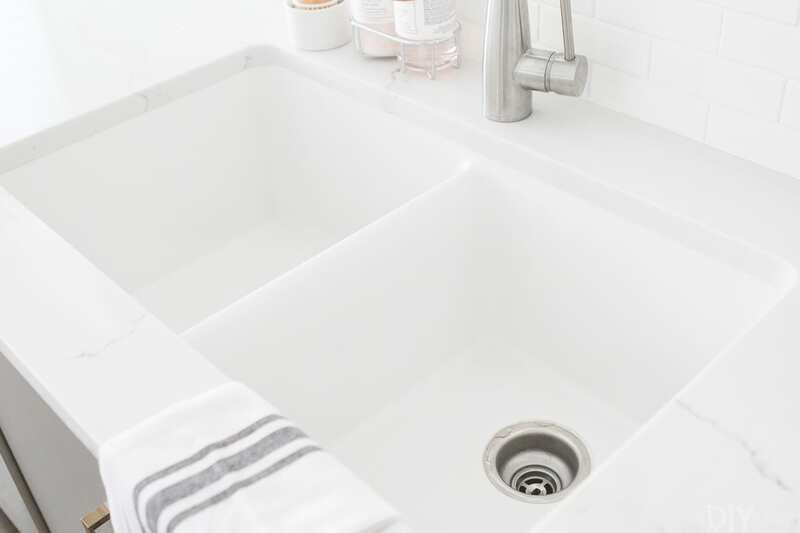 The Elkay Quartz Luxe is absolutely stunning and instead of the sink being a dark hole for dirt, the white is so bright and clean! 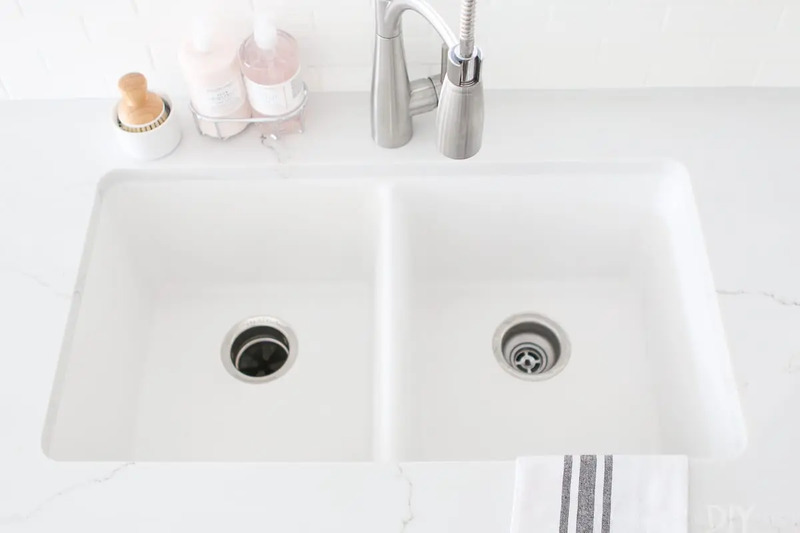 We ended up going with this quartz sink in the color “Ricotta”. 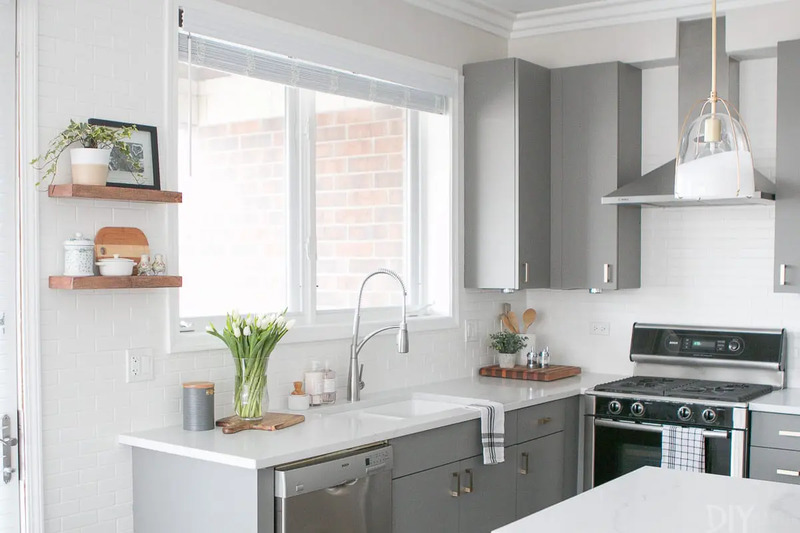 I like that there are 2 sides of the sink and it’s so deep and spacious. Lots of room for doing dishes (which is key since Jan is big on entertaining!). 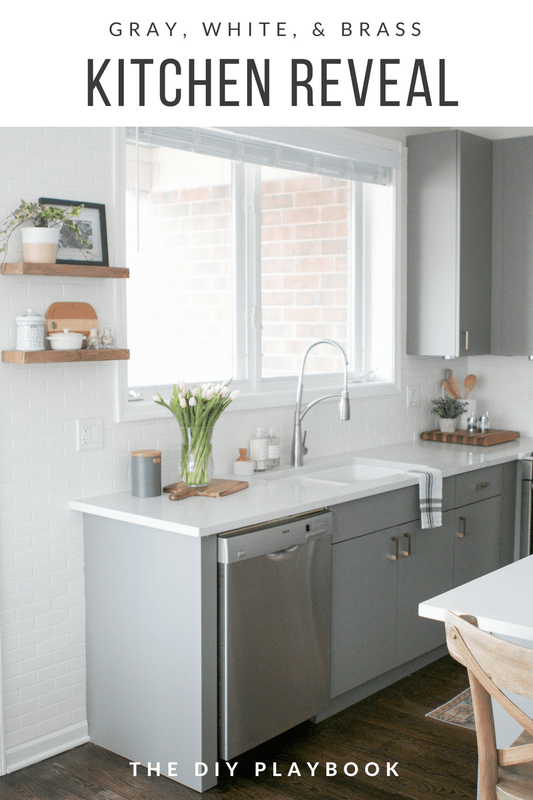 And if you’re doing a new sink, a new faucet is the icing on the cake. 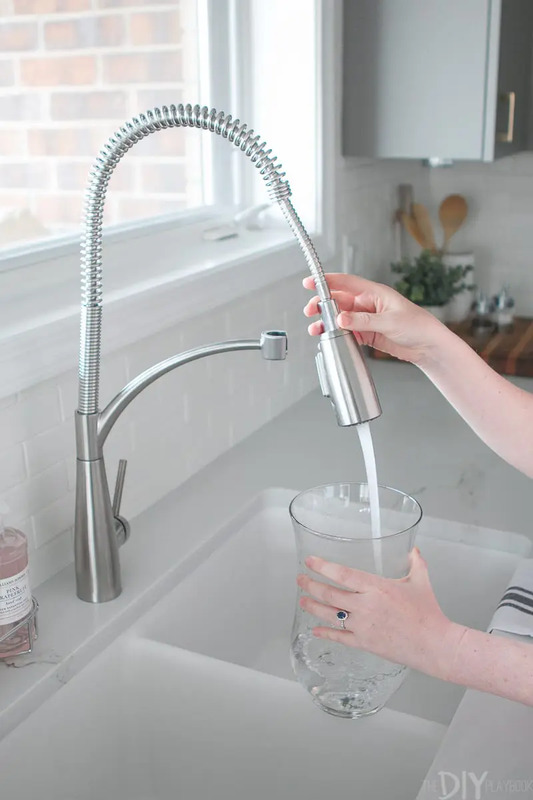 We went with the Avado faucet from Elkay in “Lustrous Steel.” It has 2 spray modes and the pull-down feature is incredibly convenient. 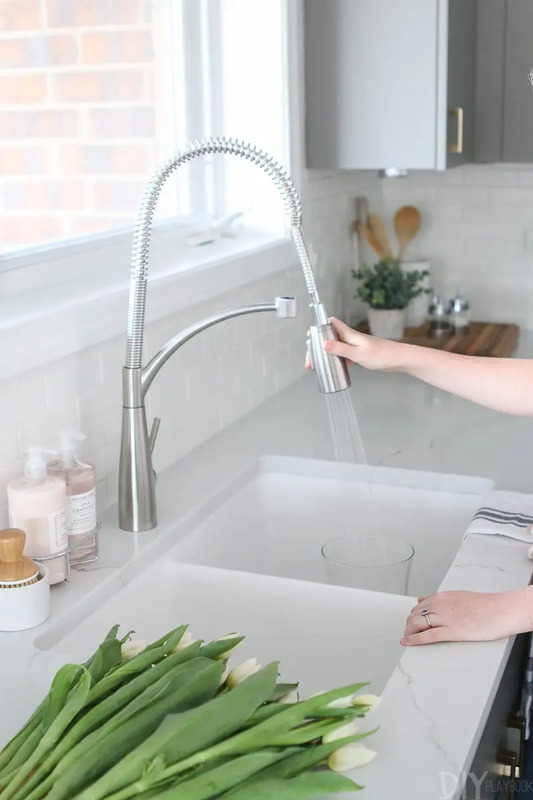 I think Bridget enjoyed using the nice faucet and sink when prepping the flowers for the photo shoot. She is making herself right at home! 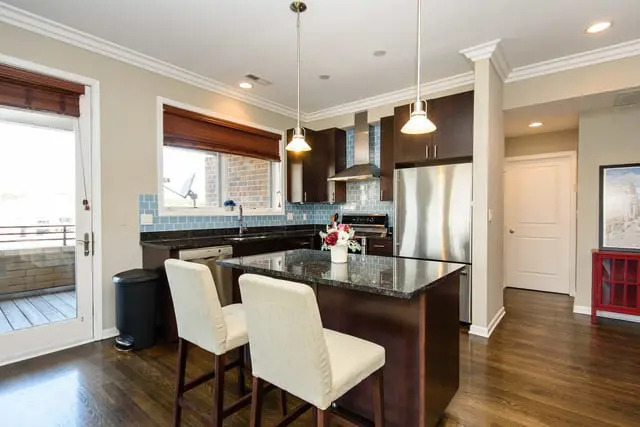 We said “bye bye” to the blue backsplash and the dark granite countertops and brightened everything up! 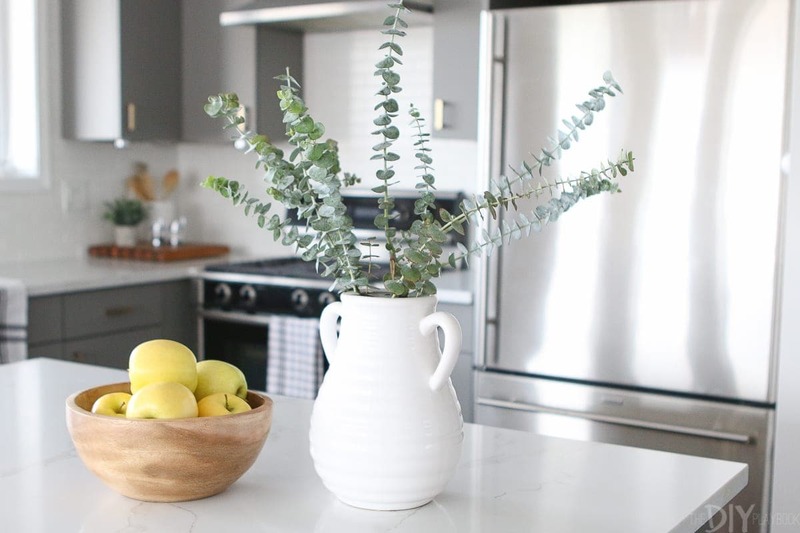 The countertops are a white quartz that have a similar look to marble. 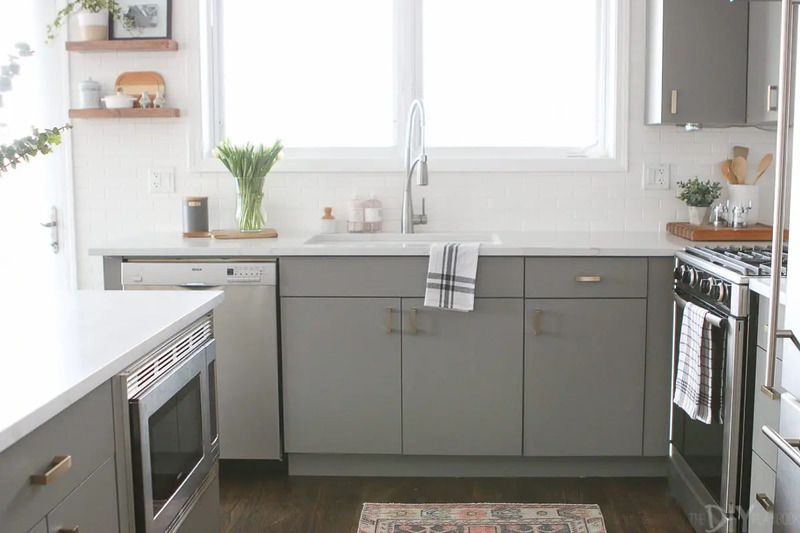 It has a nice subtle gray veining, so it isn’t too busy of a pattern. 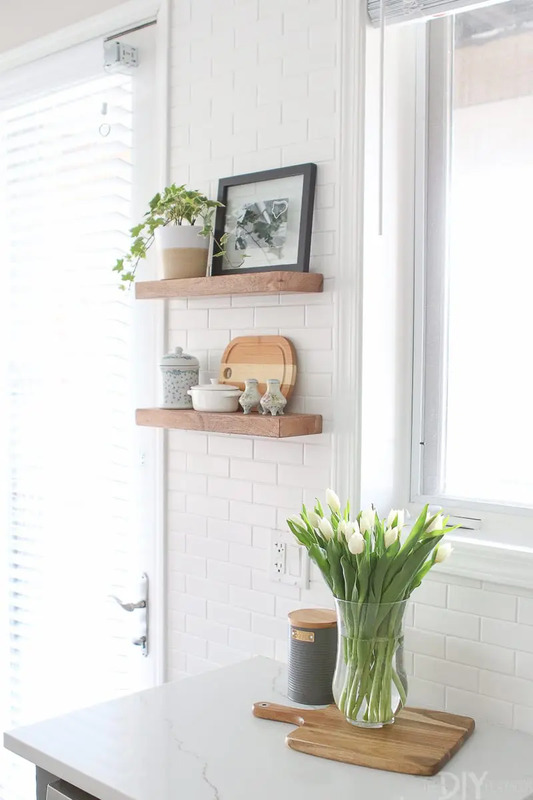 The space between the window and the patio door offered a small spot for some cute open shelves. We were dead set on finding a nice light wood tone for these and I’m so happy we found these ones. This isn’t the longest wall, so I needed to find shelves under 20″. This turned out to be quite the feat since most shelves are at least 2 feet long. Luckily, we scooped these up and they worked out perfectly! 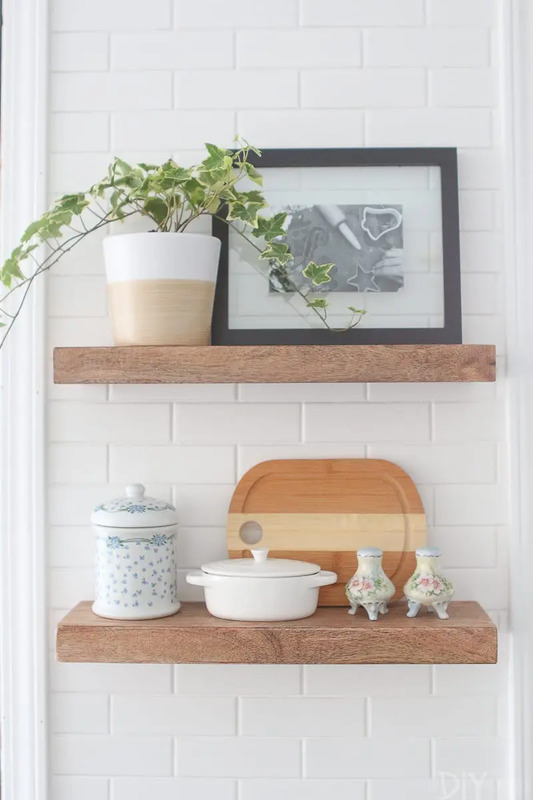 Because they’re not super long, they’re not the most functional shelves in the world. Instead, we opted to display stylish items instead. 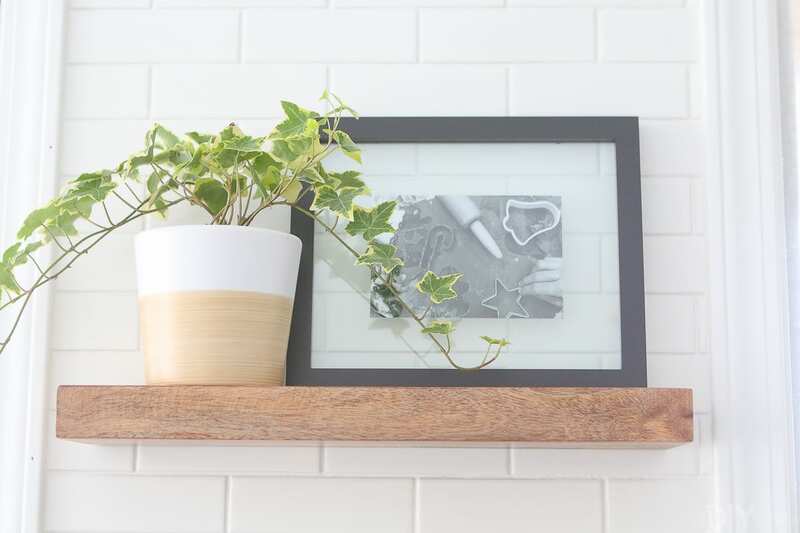 Up top, we have a framed photo from our famous cookie day, along with a little plant for greenery. 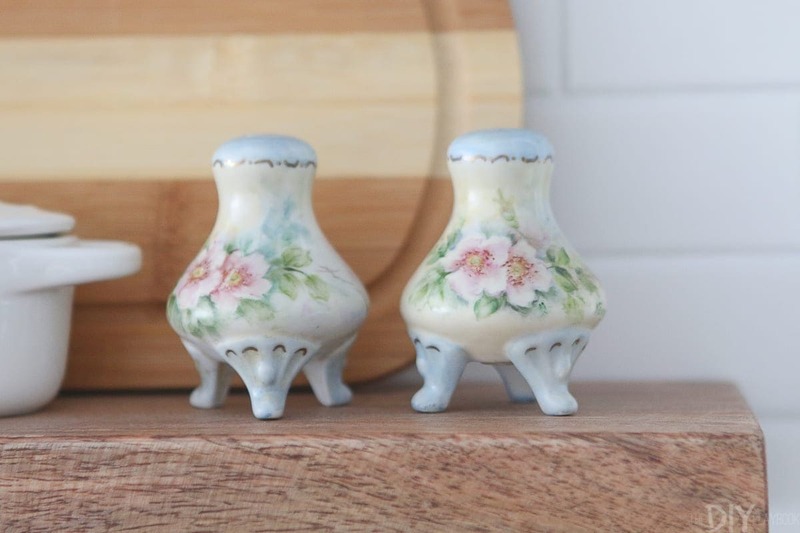 The most special pieces on the bottom are these adorable salt and pepper shakers that were hand painted by my great-grandmother. She was so talented and we each have a few pieces of her handiwork in our homes. I love that these have such a prominent place in my mom’s new kitchen. We replaced the lighting over the island with these beauties from Rejuvenation. Again, this was another tough find! 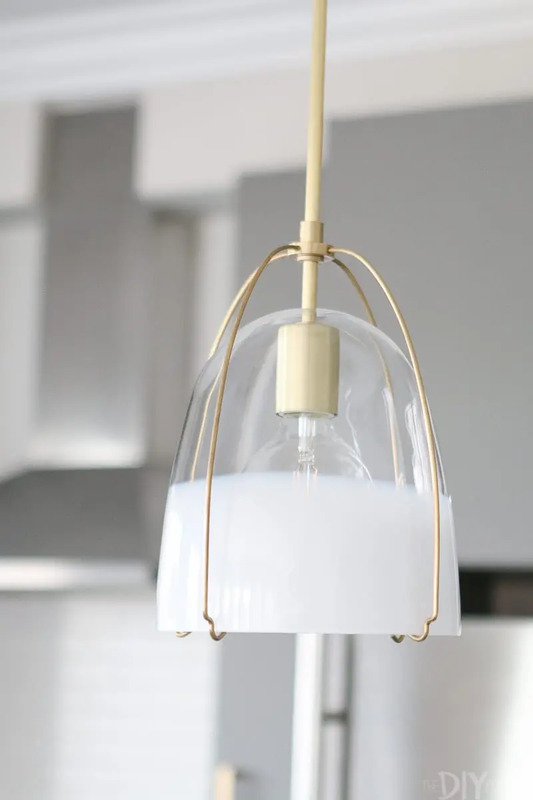 It was hard to find a good brass fixture that wasn’t overwhelmingly large. These ended up working out beautifully. It holds so much and fits on that wall nicely. 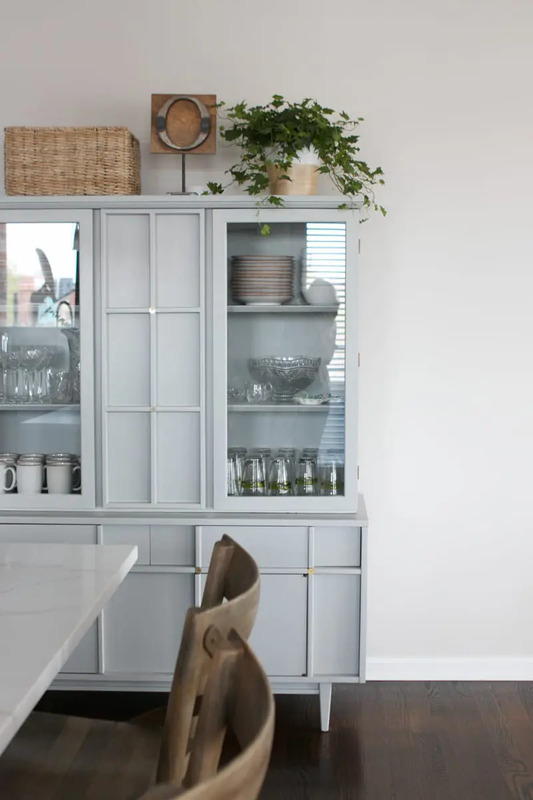 While I liked my mom’s old kitchen stools, the gray blended into the painted island. 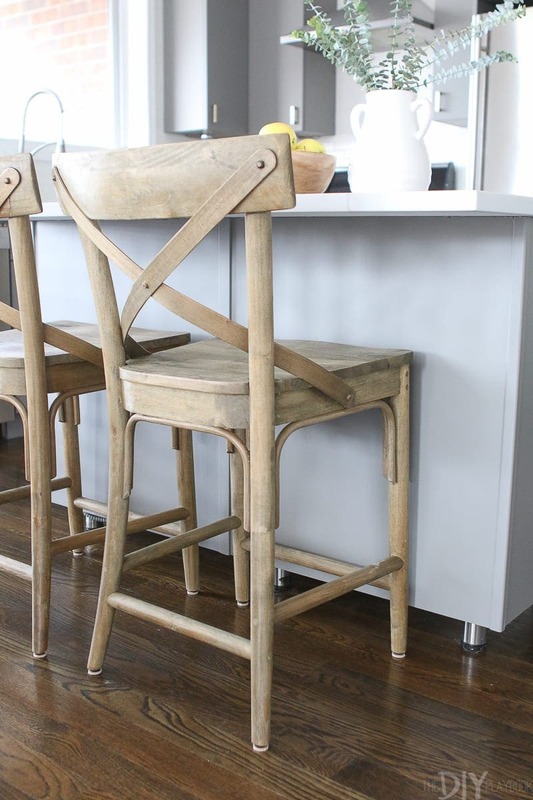 So at the last-minute we found these wood stools from World Market. Such a great price and they add so much warmth to the room. Buying kitchen accessories is actually so.much.fun! 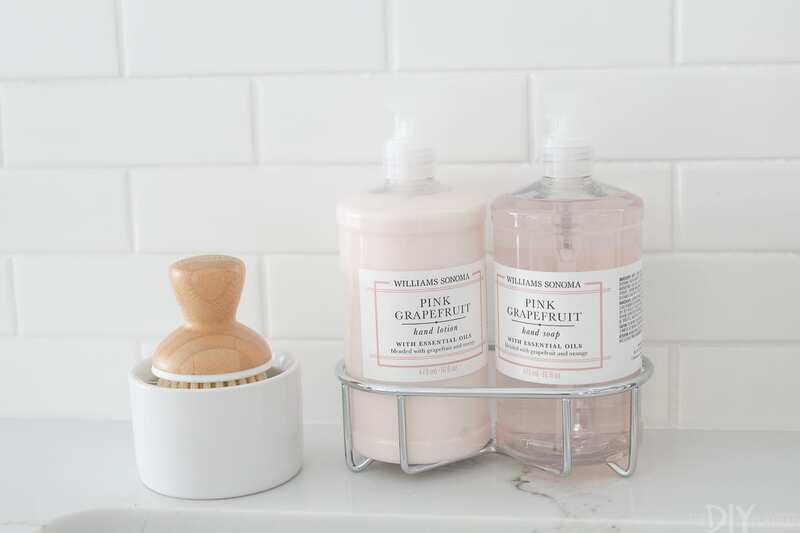 We loved finding little items to display in her new kitchen like this soap & lotion set (the grapefruit scent is the BEST!). 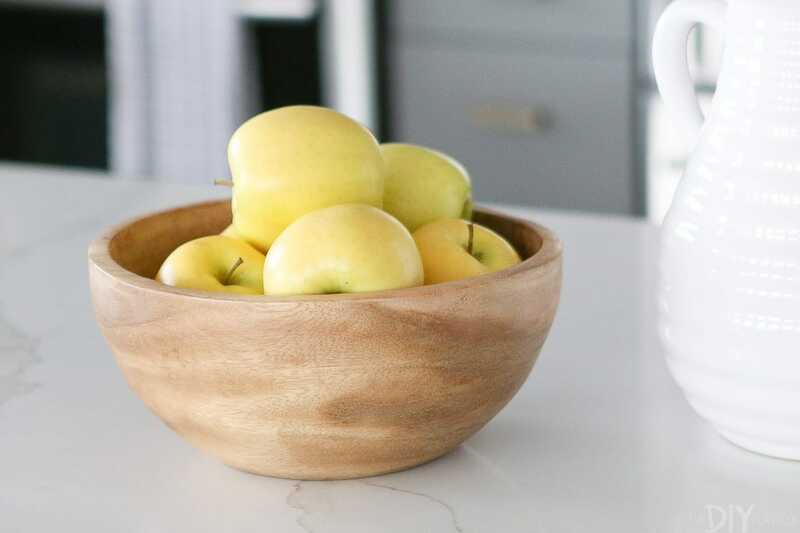 This wooden bowl from HomeGoods. And this vintage runner. Oh wait, that’s actually Bridget’s runner that we borrowed for the pics (more about this gorgeous piece here). We have our eyes peeled for something similar for Jan, but as Bridget shared in her post, the hunt can take a while! 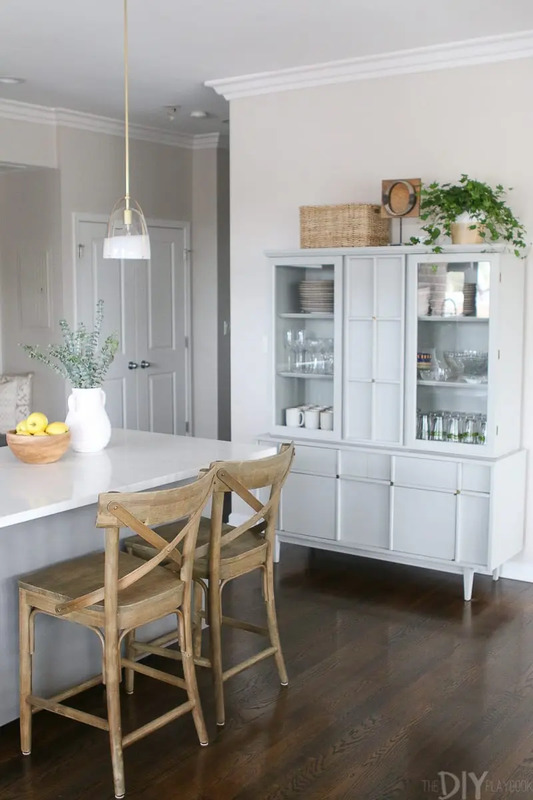 But we did love how this one looked in her kitchen, it added so much color and life. So now we know that it’s a must to really complete the look in here. If we can’t find vintage, this one is a great runner-up! I’m head over heels in love with how this turned out. 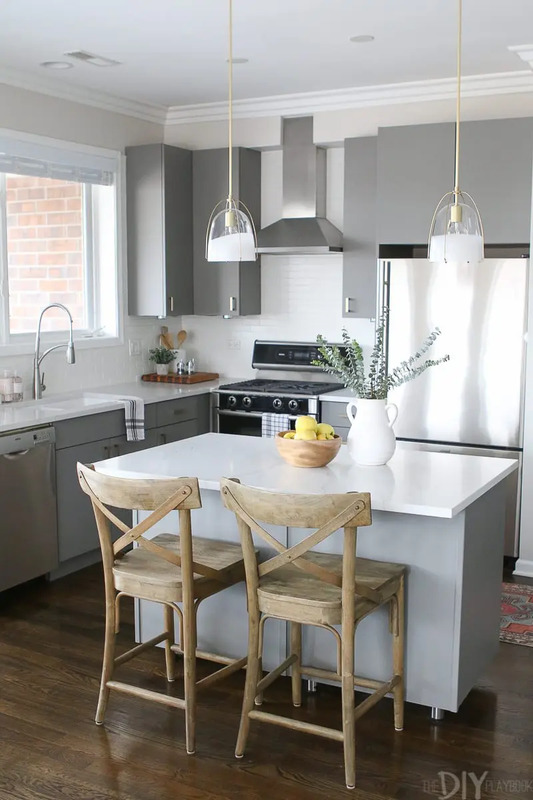 This is the first kitchen makeover we’ve been a part of and Bridget and I had so much fun helping Jan pick everything out for this gray kitchen.